Impressive. Our banner stands measure 2m tall by 840mm wide, significantly bigger than the standard 600mm wide banners offered by most firms. We use Agfa large format printers for vibrant colours and pin-sharp reproduction of images and text. Portable. 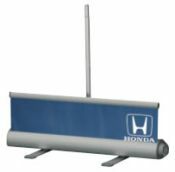 Banner stands automatically roll up into their protective cassette and come with a zip-up bag for ease of transporting. They are lightweight and easily carried using the bag's shoulder straps. Flexible. You can change the banner at any time simply by ordering a replacement graphic panel. Full instructions on how to change the panels are provided, and it is very easy to do. If you are providing your own artwork, please deduct £30.00 from the price shown above. To achieve the best results, please produce your artwork at 100% of size and at least 300dpi. If this is not possible we can accept files down to 50% of size providing they are still at least 300dpi. Please note that if you provide a file at less than 100% of size, some slight pixellation of the finished print may be noticeable, but since banners are viewed from a distance, this effect will not be problematic. More about image resolution and pixellation. If you are unsure about whether your artwork will print satisfactorily, please feel free to contact us using our Design Advice Line on 01457 778788 or using any other method of getting in touch with us. Banner stands with graphics are supplied within 7 working days. Replacement graphic panels are supplied within 5 working days. Banner stands and replacement graphic panels are standard rated for VAT. Unfortunately it is not practical for us to supply samples of roller banners. If you have any questions, please feel free to contact us using our Design Advice Line on 01457 778788 and we will be delighted to help.